What could account for our middle age peak in cognitive function: wiring? It is a common myth in our culture that we peak for everything in 20’s. But interestingly there are components of our brain that do not fully mature until middle age. Last week I posted about how for many cognitive functions including verbal memory, inductive reasoning, spatial reasoning, and verbal ability the peak does not occur until around age 53. 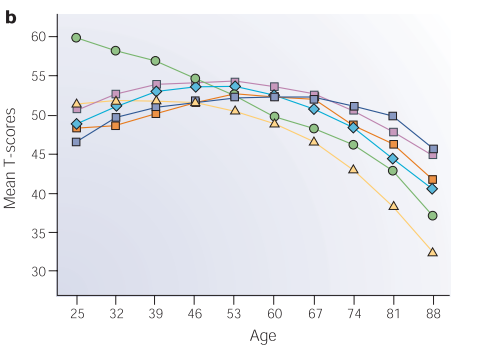 And this is despite us losing 2 grams of our brain mass each year once we get past the age of 25. So how can we be losing brain mass but have many of our cognitive functions increase from the age of 25 to 53ish? Usually we think of our body and brain becoming fully developed by our early 20’s. However, there is a growing body of research the points out that at least the brain keeps developing into middle age (actually we have known this for 20 years – but we tend to re-learn things a few times before they really settle in). The discovery is particularly significant as the prefrontal cortex is a key area of the brain and is often thought said to be key to what makes us human. It is said to be involved with decision making, social interaction and many other personality traits. But seeing changes in shape of the brain doesn’t tell us what components of the brain is changing. Is it generally thought that our gray matter (neurons) is reduced as we age and likely is the major contributor to the 2 grams of brain mass we lose each year past 25. But what about white matter – the insulator material that wraps around our axons (myelin) ? A longitudinal study that examined white matter over a lifetime found that white matter peaked at the ripe old age of 39. Interesting there was a correlation between maximum finger tapping speed and the measurement of myelin (white matter) they used – and they both in fact peaked at 39. Now finger tapping isn’t a higher cognitive function like inductive reasoning but if offers us some hints. Is it about the Myelin? Maybe myelin thickness around our axons correlate with motor and cognitive function better than other measurements of our brain (I will post another article giving more details on this later). Now there is still an open question of why our myelin peak occurs at 39 but cognitive function not until after 50, but this makes more sense that what we normally think of: we mentally peak in our 20’s and that our brain is beginning to deteriorate after the age of 25. It is possible that while our white matter peaks at age 39 it takes us some ability to fully use the potential of this wiring – part of our road to wisdom? At least one major component of our brain, white matter, does not peak until the age of 39 and this correlates reasonably well with the large number of cognitive functions that do not peak until we are in our 40’s or 50’s (though there are likely other structural and cellular contributors to this peak of mental function in middle age).